Accurate and timely diagnosis of dementia is important to guide management and provide appropriate information and support to patients and families. Currently, with the exception of individuals with genetic mutations, postmortem examination of brain tissue remains the only definitive means of establishing diagnosis in most cases, however, structural neuroimaging, in combination with clinical assessment, has value in improving diagnostic accuracy during life. Beyond the exclusion of surgical pathology, signal change and cerebral atrophy visible on structural MRI can be used to identify diagnostically relevant imaging features, which provide support for clinical diagnosis of neurodegenerative dementias. While no structural imaging feature has perfect sensitivity and specificity for a given diagnosis, there are a number of imaging characteristics which provide positive predictive value and help to narrow the differential diagnosis. While neuroradiological expertise is invaluable in accurate scan interpretation, there is much that a non-radiologist can gain from a focused and structured approach to scan analysis. In this article we describe the characteristic MRI findings of the various dementias and provide a structured algorithm with the aim of providing clinicians with a practical guide to assessing scans. The most common causes of dementia are Alzheimer's disease (AD), vascular disease (in several forms), dementia with Lewy bodies (DLB) and frontotemporal lobar degeneration (FTLD), but there are many others.10 ,11 Accurate and early diagnosis has considerable implications for the patient in terms of prognosis and management and will be increasingly important if and when disease modifying treatments become available. Currently, postmortem examination of brain tissue remains the only definitive means of establishing diagnosis in most cases. Molecular biomarkers are now available to provide support for a diagnosis of AD in life, for example, amyloid imaging with positron emission tomography (PET) and cerebrospinal fluid (CSF) analysis of amyloid-β (Aβ1–42) and tau,12 ,13 however, these markers are mainly research tools and definitive blood tests are still lacking. Until these techniques become widely available, structural neuroimaging, in combination with clinical assessment, offers the greatest utility in improving diagnostic accuracy during life. The UK National Institute of Health and Care Excellence (NICE), European and US diagnostic guidelines14–17 recommend that structural imaging (non-contrast enhanced CT or ideally MRI) should be performed in the evaluation of patients with suspected dementia. In recognition of advances in imaging research, the justification for this has shifted from the exclusion of surgical pathology (eg, cerebral tumours), although still relevant, to the inclusion of features that help to support a clinical diagnosis of the underlying cause(s) of the dementia. MRI offers a number of advantages over CT18 and is the imaging modality of choice in identifying diagnostic imaging features.14 ,15 ,17 While no structural imaging features have perfect sensitivity and specificity for any given diagnosis, there are a number which provide positive predictive value and help to narrow the differential diagnosis to the most likely underlying pathologies. By describing these characteristic MRI findings in the context of a structured algorithm, this article aims to provide clinicians with a practical means of extracting useful imaging features of common dementias in order to improve diagnostic accuracy. While neuroradiology expertise is invaluable in accurate scan interpretation, there is much that a non-radiologist can gain from a focused and structured approach to scan analysis. Beyond the exclusion of surgical pathology, structural MRI in patients with suspected dementia should be assessed in terms of signal change on MRI and cerebral atrophy in a systematic fashion.19 The assessment of signal change using T2-weighted imaging or fluid attenuated inversion recovery (FLAIR) can be used to help identify vascular damage, but can also indicate inflammatory, metabolic, toxic or infective processes which may be contributing to cognitive deficits. The presence and topographical pattern of cerebral atrophy has (pathologically proven) positive predictive value for dementia.20 Based on these two broad categories, a systematic approach to identifying diagnostically relevant imaging features, which provide support for clinical diagnosis, is presented in figure 1 and discussed in detail below and expanded in figures 2 and 3. Using the predominant imaging features of the most common causes of dementia, the diagnosis with the greatest likelihood is presented. Figure 4 presents (mostly pathologically proven) imaging examples of many of the features described. Algorithmic assessment of MRI in dementia. An approach to signal change assessment in cognitive impairment. An approach to cerebral atrophy assessment in cognitive impairment. Images demonstrating characteristic atrophy in several forms of pathologically proven dementia (Displayed as clinical diagnosis—pathology diagnosis, * indicates pathology findings not available). Signal intensity within a single tissue type should be reasonably uniform on MRI. The presence of regions of hyperintensity or hypointensity within the tissue typically reflects pathology. In the context of a suspected dementia, punctate or confluent regions of signal change within white matter or deep grey matter are most commonly associated with vascular pathology, but rarely (and in the correct clinical context) may also indicate inflammatory, metabolic or infective processes. The prevalence of vascular cognitive impairment (VCI) is second only to AD. They share many risk factors, including an increasing prevalence with age, and therefore, in many patients vascular and degenerative pathology coexist.23 The exact interaction between neurodegenerative and vascular pathology is debated but critically for the patient, it is important that vascular risk factors are managed and treated. Differentiating the relative contribution of vascular from neurodegenerative pathology as the cause of a patient's cognitive problems is a common clinical problem where MRI plays a central role. If MRI is not possible, CT can also be used relatively effectively to evaluate the presence and extent of cerebrovascular disease, with changes in white matter appearing hypodense. T2-weighted images including FLAIR are most useful in detecting ischaemic changes while T2* or susceptibility weighted imaging can identify microbleeds suggestive of cerebral amyloid angiopathy or arteriosclerotic small vessel disease (SVD). Diffusion weighted imaging may be useful in cases of rapid cognitive decline suggestive of prion disease. Figure 2 describes a systematic assessment of MR signal changes in the context of dementia. Striatum and/or neocortex: Although rare, Creutzfeldt-Jakob disease is included in the algorithm as it has very characteristic MRI features: hyperintensities in the cortex and/or basal ganglia, particularly in the putamen, best seen on FLAIR imaging. Diffusion weighted imaging sequences have greater sensitivity to hyperintensities within these regions38 (see figure 4), which may be especially prominent in the early stages of the disease when vacuoles are small resulting in restricted diffusion.19 In rapidly progressive dementia where there is doubt over the diagnosis of Creutzfeldt-Jakob disease, contrast enhanced MRI scanning is recommended to rule out alternative causes. No Regions of Hyperintensity: The absence of hyperintensities on T2 or FLAIR imaging indicates the patient's symptoms are very unlikely to be vascular in origin. Neurodegenerative pathology therefore remains the most likely cause of cognitive impairment and structural imaging should be assessed for atrophy. T2* hypointensities may also result from calcification, iron deposits (from causes other than CMBs), haemorrhagic metastasis or diffuse axonal injury. Care should also be taken to exclude MR artefacts such as flow voids or signals from temporal bones. Atrophy is the principal imaging finding in neurodegenerative dementias and is typically best identified on T1-weighted images and assessed on a combination of axial, sagittal and coronal views. Despite a degree of overlap among disease subtypes, some patterns of atrophy are indicative of specific underlying pathology, however, such findings should be considered in the context of the patient's age and clinical examination. 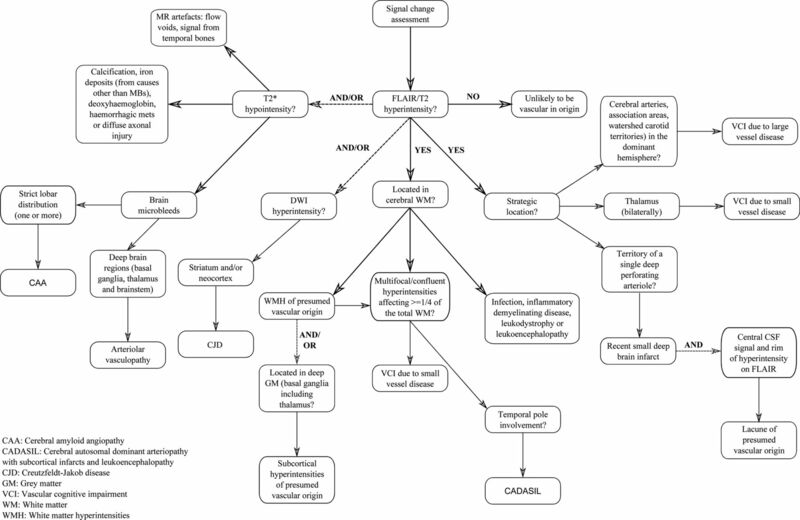 Figure 3 sets out an approach to the assessment of cerebral atrophy. Atrophy with a focal lobar predominance is a useful starting point to help narrow the differential diagnosis in patients with cognitive decline. In particular, an asymmetrical pattern of atrophy (left greater than right or vice versa) or more anterior than posterior atrophy, is more suggestive of underlying FTLD pathology rather than AD pathology. Frontal lobe: Disproportionate frontal lobe atrophy is associated with FTLD pathology but does not differentiate between different FTLD histopathologies (eg, Pick's disease or corticobasal degeneration (CBD)). Patients with behavioural variant FTD (bvFTD) may have symmetrical or asymmetrical frontal atrophy with or without additional temporal lobe atrophy.44–46 Despite a typically asymmetric clinical presentation, symmetrical frontal lobe atrophy is the predominant imaging finding in patients with dementia due to CBD pathology.47–49 However, many patients with a clinical diagnosis of corticobasal syndrome are found to have pathology other than CBD at postmortem,50 which may account for some of the variability reported in the literature. Currently imaging features are not included in the diagnostic criteria for CBD.51 Left-sided posterior frontoinsular atrophy, which may be limited to a subtle widening of the left sylvian fissure, is typically found in cases of progressive non-fluent aphasia44 ,52 (see figure 4). Temporal lobe: Asymmetric temporal atrophy is most commonly due to FTLD pathology but can also be due to AD. The semantic dementia variant of FTD has a characteristic pattern of loss: typically, left greater than right focal anterior temporal atrophy particularly involving the temporal pole (which progresses to ‘knife edge’ atrophy), the amygdala and anterior hippocampus and often selective loss of anterior fusiform gyrus, with relative preservation of more posterior structures.44 ,45 ,52–54 Asymmetrical atrophy of the right temporal lobe with a similar distribution to SD may also occur, most commonly presenting as bvFTD and often with additional features of prosopagnosia and/or topographical memory impairment.55 While the asymmetry is usually dramatic in SD and the right temporal variant of bvFTD, both temporal lobes usually become involved and over time the pattern of atrophy may start to look more symmetrical (see figure 4).45 ,56 ,57 Logopenic aphasia (LPA) is also associated with greater left-sided atrophy in the temporal lobe although in contrast to SD the pattern of atrophy extends more posteriorly than in SD, predominantly affecting the posterior perisylvian and temporoparietal areas (angular gyrus, posterior middle temporal gyrus, superior temporal gyrus and superior temporal sulcus) 44 ,58 (see figure 4). Unlike the majority of clinical syndromes associated with an asymmetrical pattern of atrophy, LPA is typically found to be a result of AD pathology.49 Nonetheless the presence of an anterior/posterior atrophy gradient in the temporal lobe is suggestive of FTLD rather than AD and can usefully be assessed by scrolling posterior to anterior through coronal T1 slices of the temporal lobe. Global volume loss without focal lobar atrophy is a common and non-specific finding on structural MRI studies in normal ageing and dementia, and it can sometimes be difficult to determine where normal ageing ends and pathological atrophy begins. Symmetrical generalised atrophy (ie, left=right, anterior=posterior) is typically seen in AD and DLB, and may also accompany white matter changes in patients with vascular disease. When all stages fail to reveal any abnormalities, beyond what is expected for age, the scan is reported as within normal limits. This does not of course exclude dementia, nor does it rule out a neurodegenerative cause particularly if the clinical syndrome is mild. If clinical suspicion persists, a SPECT (single photon emission computed tomography) or PET scan can be helpful to look for changes in cerebral perfusion/metabolism, or repeat MRI scanning in 6–12 months. Normal imaging particularly with repeat imaging after (greater than) 6 months should however prompt consideration of a non-neurodegenerative cause including psychiatric conditions. In the future molecular diagnostic indices such as CSF Aβ1–42 or amyloid PET scanning may increasingly be used to confirm or exclude the presence of AD (amyloid) pathology in these cases. Clinical diagnosis of the cause of cognitive complaints or decline can be difficult. Nonetheless accurate and timely diagnosis is increasingly important to guide management and to provide appropriate information and support. As reflected in current diagnostic guidelines, structural imaging can provide valuable positive as well as negative predictive information and the algorithm described here, based on reported imaging features with greatest diagnostic value, is designed to provide a systematic aid to help differentiate between the different causes of dementia. It is of course important that imaging findings are interpreted in the correct clinical context and that the limitations of making an individual diagnosis on the basis of imaging findings are recognised. In the meantime, structural imaging in cognitive cases can provide easily accessible, clinically useful information that can be realistically assessed by the non-specialist. Using a systematic approach such as set out in this article may help clinicians in evaluating their own scans, rather than relying on radiological reports alone, and ultimately support the diagnostic process. Further work is, however, required to evaluate the sensitivity and specificity of imaging signatures for neurodegenerative pathology. The authors thank Dr Colin Mahoney for helpful comments on atrophy in FTD. This work was carried out at the NIHR Queen Square Biomedical Research Unit in Dementia, and with the support of the Leonard Wolfson Experimental Neurology Centre. The Dementia Research Centre is an Alzheimer's Research UK Coordinating Centre. LH is supported by Alzheimer's Research UK. World Health Organisation. Alzheimer's disease international. Dementia: A public health priority. WHO Press, 2012. Direction générale de l'action sociale, Direction de la sécurité sociale, Direction de l'hospitalisation et de l'organisation des soins. Plan Alzheimer et maladies apparentées 2008–2012. 2008. UK Department of Health. Living well with dementia: a National Dementia Strategy. 2009. UK Department of Health. Prime minister's challenge on dementia—Delivering major improvements in dementia care and research by 2015. 2012. US Department of Health and Human Services. National plan to address Alzheimer's disease. 2012.
. Dementia skills and competencies for primary care liaison: a model for improving identification and timely diagnosis. Prim Health Care Res Dev 2013 Jul;14(3):240–9.
. Cognitive impairment in elderly medical inpatients: detection and associated six-month outcomes. Am J Geriatr Psychiatry 2004;12:639–47.
. Clinical recognition of dementia and cognitive impairment in primary care: a meta-analysis of physician accuracy. Acta Psychiatr Scand 2011;124:165–83.
. Dementia in the acute hospital: prospective cohort study of prevalence and mortality. Br J Psychiatry 2009;195:61–6.
. Genetics of dementia: update and guidelines for the clinician. Am J Med Genet B Neuropsychiatr Genet. 2012;159B:628–43.
. The diagnosis of young-onset dementia. Lancet Neurol 2010;9:793–806.
. Cerebral PET with florbetapir compared with neuropathology at autopsy for detection of neuritic amyloid-βplaques: a prospective cohort study. Lancet Neurol 2012;11:669–78.
. CSF biomarkers and incipient Alzheimer disease in patients with mild cognitive impairment. JAMA 2009;302:385–93.
. Research criteria for the diagnosis of Alzheimer's disease: revising the NINCDS-ADRDA criteria. Lancet Neurol 2007;6:734–46.
. EFNS guidelines for the diagnosis and management of Alzheimer's disease. Eur J Neurol 2010;17:1236–48.
. Introduction to the recommendations from the National Institute on Aging-Alzheimer's Association workgroups on diagnostic guidelines for Alzheimer's disease. Alzheimers Dement 2011;7:257–62. NCC for Mental Health. Dementia: The NICE-SCIE Guideline on Supporting People with Dementia and Their Carers in Health and Social Care (National Clinical Practice Guideline). British Psychological Society and RCPsych Publications; 2007.
. Structural magnetic resonance imaging in the practical assessment of dementia: beyond exclusion. Lancet Neurol 2002;1:13–21.
. Neuroimaging in Dementia. Springer Berlin Heidelberg, 2011.
. Visual assessment of atrophy on magnetic resonance imaging in the diagnosis of pathologically confirmed young-onset dementias. Arch Neurol 2005;62:1410–15.
. Vascular contributions to cognitive impairment and dementia: a statement for healthcare professionals from the american heart association/american stroke association. Stroke 2011;42:2672–713.
. Vascular dementia: diagnostic criteria for research studies. Report of the NINDS-AIREN International Workshop. Neurology 1993;43:250–60.
. Neuroimaging standards for research into small vessel disease and its contribution to ageing and neurodegeneration. Lancet Neurol 2013;12:822–38.
. A new rating scale for age-related white matter changes applicable to MRI and CT. Stroke 2001;32:1318–22.
. Operational definitions for the NINDS-AIREN criteria for vascular dementia: an interobserver study. Stroke 2003;34:1907–12.
. Hereditary cerebral small vessel diseases: a review. J Neurol Sci 2012;322:25–30.
. Comparison of MRI criteria at first presentation to predict conversion to clinically definite multiple sclerosis. Brain 1997;120(Pt 11):2059–69.
. Magnetic resonance of myelination and myelin disorders. illustrated edn. Springer, 2005.
. An exploratory study of long-term neurocognitive outcomes following recovery from opportunistic brain infections in HIV+ adults. J Clin Exp Neuropsychol 2008;30:836–43.
. The thalamus and behavior: effects of anatomically distinct strokes. Neurology 2006;66:1817–23.
. Thalamic lesions in vascular dementia: low sensitivity of fluid-attenuated inversion recovery (FLAIR) imaging. Stroke 2004;35:415–19.
. Creutzfeldt-Jakob disease: comparative analysis of MR imaging sequences. AJNR Am J Neuroradiol 2006;27:1459–62.
. Cerebral microbleed detection and mapping: principles, methodological aspects and rationale in vascular dementia. Exp Gerontol 2012;47:843–52.
. Brain microbleeds and Alzheimer's disease: innocent observation or key player? Brain 2011;134(Pt 2):335–44.
. Cerebral microbleeds in familial Alzheimer's disease. Brain 2012;135(Pt 1):e201; author reply e202.
. Incidence of cerebral microbleeds in the general population: the Rotterdam Scan Study. Stroke 2011;42:656–61.
. Classification of primary progressive aphasia and its variants. 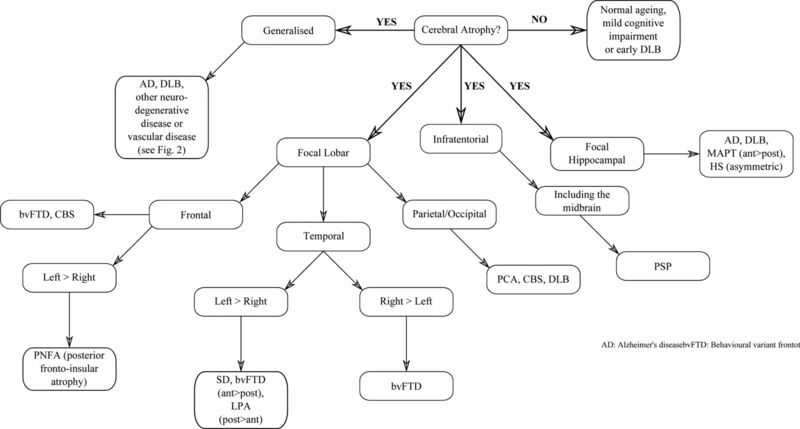 Neurology 2011;76:1006–14.
. Cortical morphometric subclassification of frontotemporal lobar degeneration. AJNR Am J Neuroradiol 2009;30:1233–9.
. Frontal asymmetry in behavioral variant frontotemporal dementia: clinicoimaging and pathogenetic correlates. Neurobiol Aging 2013;34:636–9.
. Clinicopathological correlations in corticobasal degeneration. Ann Neurol 2011;70:327–40.
. Clinical and neuroanatomical signatures of tissue pathology in frontotemporal lobar degeneration. Brain 2011;134(Pt 9):2565–81.
. Neuroimaging in frontotemporal lobar degeneration–predicting molecular pathology. Nat Rev Neurol 2011;8:131–42.
. Pathologic heterogeneity in clinically diagnosed corticobasal degeneration. Neurology 1999;53:795–800.
. Rates of hemispheric and lobar atrophy in the language variants of frontotemporal lobar degeneration. J Alzheimers Dis 2012;30:407–11.
. Patterns of temporal lobe atrophy in semantic dementia and Alzheimer's disease. Ann Neurol 2001;49:433–42.
. Cognition and anatomy in three variants of primary progressive aphasia. Ann Neurol 2004;55:335–46.
. 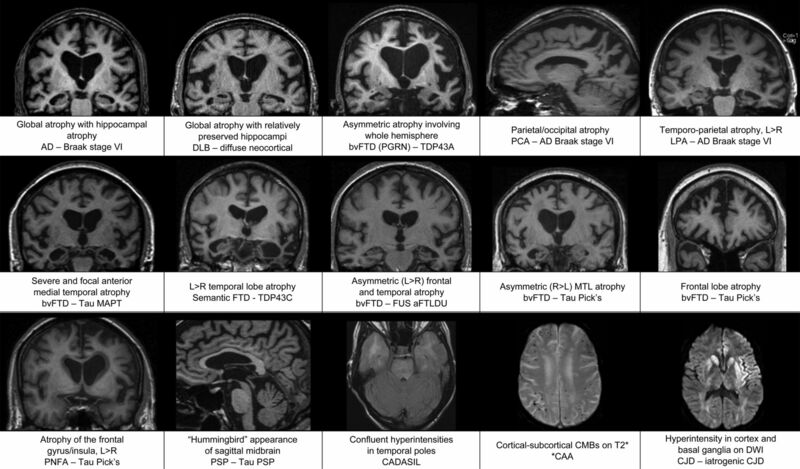 The clinical profile of right temporal lobe atrophy. Brain 2009;132(Pt 5):1287–98.
. Sensitivity of revised diagnostic criteria for the behavioural variant of frontotemporal dementia. Brain 2011;134(Pt 9):2456–77.
. Neuroanatomical correlates of behavioural disorders in dementia. Brain 2005;128(Pt 11):2612–25.
. Progressive logopenic/phonological aphasia: erosion of the language network. Neuroimage 2010;49:984–93.
. Posterior cerebral atrophy in the absence of medial temporal lobe atrophy in pathologically-confirmed Alzheimer's disease. Neurobiol Aging 2012;33:627.e1–627.e12.
. Visual assessment of posterior atrophy development of a MRI rating scale. Eur Radiol 2011;21: 2618–25.
. A distinct clinical, neuropsychological and radiological phenotype is associated with progranulin gene mutations in a large UK series. Brain 2008;1313):706–20.
. Distinct profiles of brain atrophy in frontotemporal lobar degeneration caused by progranulin and tau mutations. Neuroimage 2010;53:1070–6.
. Neuroimaging signatures of frontotemporal dementia genetics: C9ORF72, tau, progranulin and sporadics. Brain 2012;135(Pt 3):794–806.
. Sensitivity and specificity of medial temporal lobe visual ratings and multivariate regional MRI classification in Alzheimer's disease. PLoS One 2011;6:e22506.
. Medial temporal lobe atrophy on MRI differentiates Alzheimer's disease from dementia with Lewy bodies and vascular cognitive impairment: a prospective study with pathological verification of diagnosis. Brain 2009;132(Pt 1):195–203.
. Diagnosis and management of dementia with Lewy bodies: third report of the DLB Consortium. Neurology 2005;65:1863–72.
. Quantitative neuropathological study of Alzheimer-type pathology in the hippocampus: comparison of senile dementia of Alzheimer type, senile dementia of Lewy body type, Parkinson's disease and non-demented elderly control patients. J Neurol Sci 1991;106:142–52.
. Dementia with Lewy bodies: a comparison of clinical diagnosis, FP-CIT single photon emission computed tomography imaging and autopsy. J Neurol Neurosurg Psychiatry 2007;78:1176–81.
. Phenotypic signatures of genetic frontotemporal dementia. Curr Opin Neurol 2011;24:542–9.
. Differentiation of atypical parkinsonian syndromes with routine MRI. Neurology 2000;54:697–702.
. Core candidate neurochemical and imaging biomarkers of Alzheimer's disease. Alzheimers Dement 2008;4:38–48.
. Biomarkers for Alzheimer's disease: academic, industry and regulatory perspectives. Nat Rev Drug Discov 2010;9:560–74.
. Clinical use of brain volumetry. J Magn Reson Imaging 2013;37:1–14. Contributors NCF, FB and PS devised the original concept of the article. LH, NCF and JMS planned and wrote the article. All authors revised and approved the final version to be published.